Mistakes made his regular season debut in a convincing Uprising win. 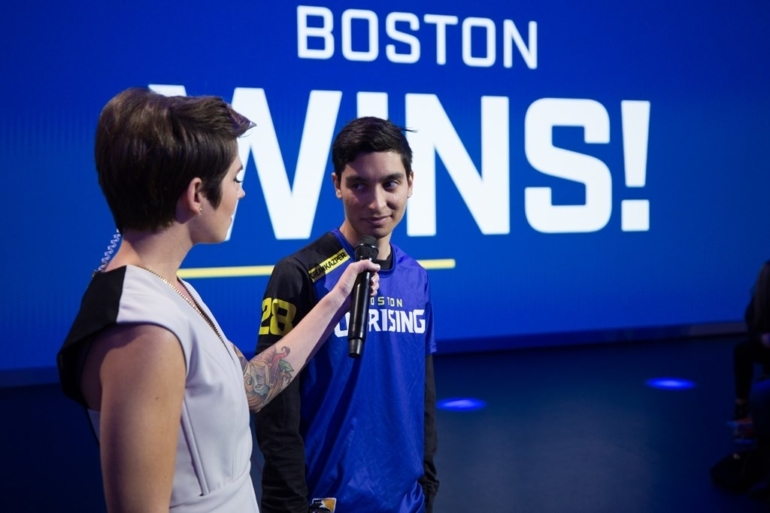 The breakout team of Stage One of the Overwatch League was the Boston Uprising, a squad of relatively no-name players no one expected to succeed who nearly made the stage playoffs. But in Stage Two, the uprising was over. Entering today’s match against the Florida Mayhem, the Uprising had yet to win a map in three series, posting a dismal 0-12 map score. Today they put that losing streak to bed, however, ending their slump with a 4-0 sweep over the Mayhem. The win was a convincing one, even if it came against the 1-13 Florida side. The Uprising also shook things up with some changes in the lineup, one of the oldest tricks in the book for coaches looking to end a slump. The Boston coaching staff made a bold move benching veteran main tank and in-game leader Noh “Gamsu” Young-jin. Taking a player rated as one of the best main tanks in the league out of the lineup is a tough choice to make, and while his replacement Shin “Kalios” Woo-yeol is a strong off-tank, playing the main role is a different animal. But the move worked, seemingly awakening an Uprising team that was asleep so far in Stage Two. Volskaya ended quickly in Uprising’s favor, as the team full-held the Mayhem on their defense after their own solid attack. Lijiang Tower was closer with Mayhem’s Tracer, Andreas “Logix” Berghmans, putting together some impressive displays. But Uprising’s Tracer, Kwon “Striker” Nam-joo, was even better, securing some clutch solo kills against four foes to buy time for his team to come back and win the round. Then the Uprising also pulled out another tool in their box: Russian DPS player Stanislav “Mistakes” Danilov, who made his regular season OWL debut. But instead of subbing the player famed for his Tracer in for Striker, Uprising’s Tracer main, they put Mistakes in for Jonathan “DreamKazper” Sanchez. On Hollywood and Route 66, the Uprising showed why, playing Mistakes on Sombra and Junkrat—two heroes outside of DreamKazper’s impressive repertoire. Both maps featured Uprising using Mistakes’ strong Sombra play to put together great defensive rounds and even big attack showings, disrupting Mayhem’s Sombra defense at Big Earl’s on Route 66 with some hacks of their own. Overall, it was a convincing victory for the Boston Uprising, but it’s not enough to show that their slump is over. The Florida Mayhem may look a bit better in the new meta, but they’re still 1-13 on the season—and they’re a team the Uprising should handle like they did today. Still, it’s nice to put a mark in the win column for Uprising, and they did so thanks to Mistakes, whose Sombra looked deadly.